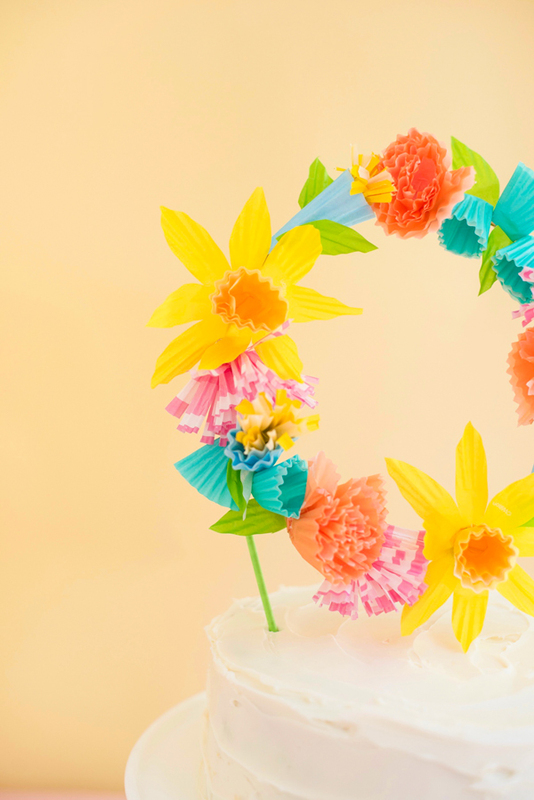 I was so inspired by this project, I set out to see what other flowers could be made using only cupcake liners. 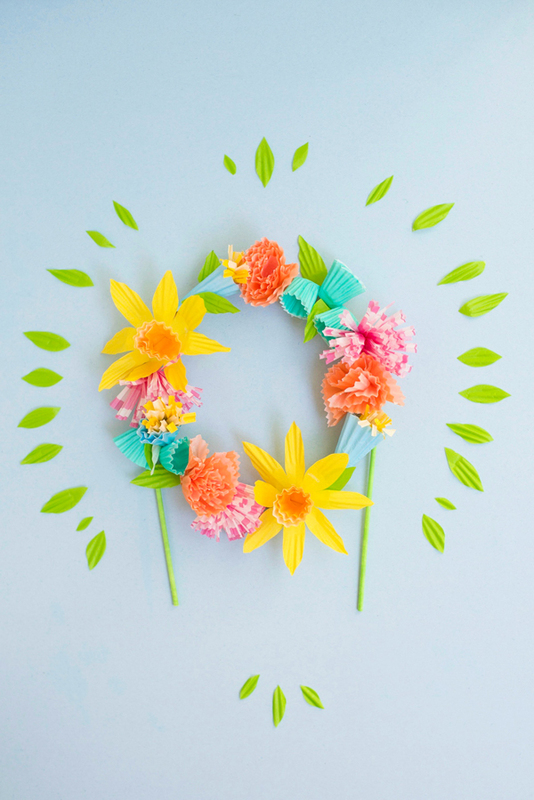 Attached to a hoop, they create a festive wreath that can be used as a cake topper. 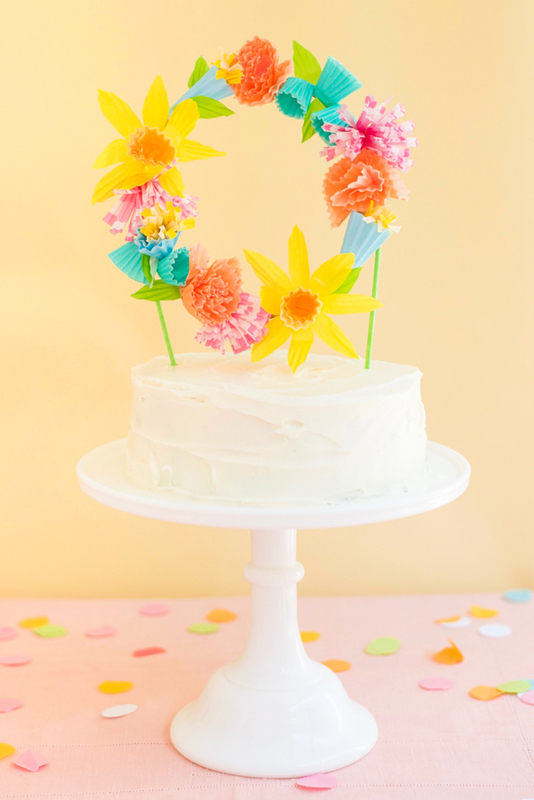 When the cake’s been eaten, remove the sticks, loop a string through the top and hang it up for a pretty decoration. 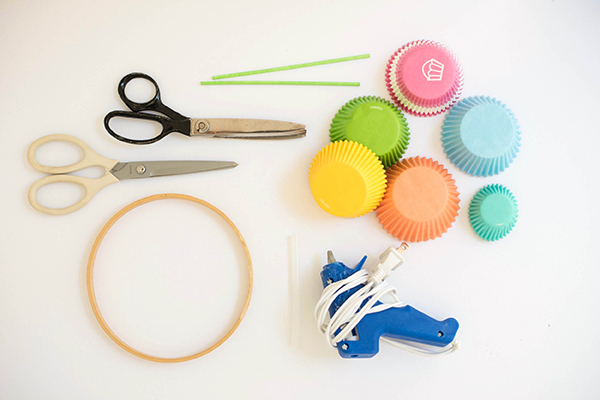 Materials needed: cupcake liners in assorted colors –regular sized pink, yellow, light blue, orange, yellow and green liners, and mini size in teal, green cake pop sticks, hot glue gun, scissors, 6-inch embroidery hoop (one piece of it), pinking shears. Step 1: Flatten two liners pink liners (I used a pink and white design). Fold them in half and stack them on top of each other. Step 2: Cut fringe into the edge of the pink liners. Step 3: Pinch the pointed end and apply a dab of hot glue, folding the tip towards the fringed edge. Fluff fringe with fingers. Step 1: Flatten two orange liners, fold in half and stack on top of each other. Step 2: Trim the curved edge with pinking shears. Step 3: Pinch the pointed end and apply a dab of hot glue, folding the tip towards the sheared edge. Fluff flowers out with fingers. Step 4: Fold a yellow baking cup in quarters. 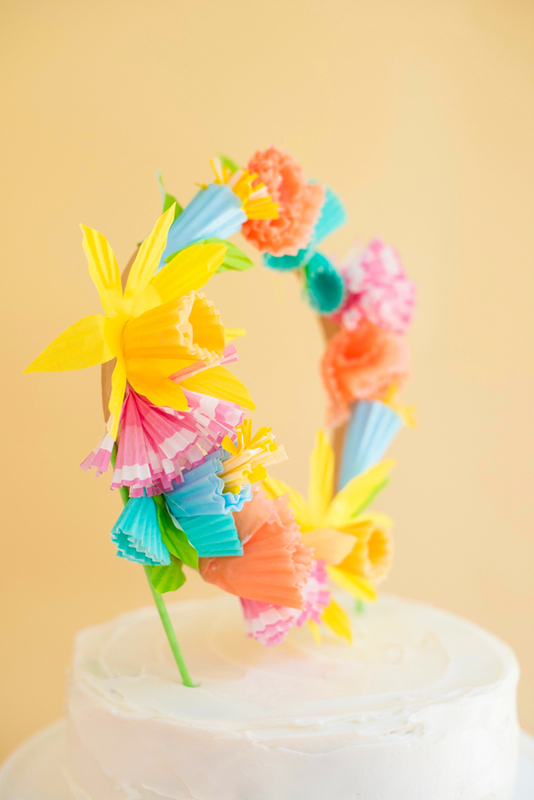 Step 6: Attach the petals to the cup with hot glue. Step 1: Gently fold a mini cup in half and twist it around your finger to create a cup shape. Try not to crush the ruffle. Step 3: Stick your finger into the cup, and bend back the base of the cup. Apply a dab of hot glue under the bent end and press closed. Repeat 3-4 times. Step 3: Take a yellow cupcake liner, fold in half, then half again. Cut fringe into the curved edge. 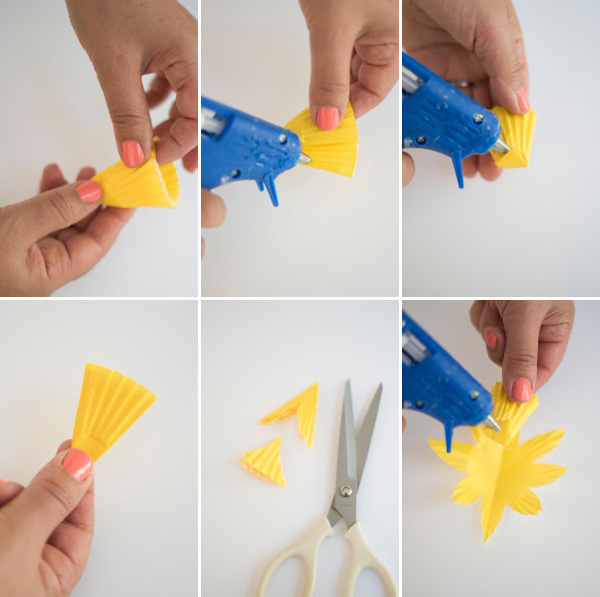 Squeeze the pointed edge, apply a dab of hot glue, and insert into the blue cone. 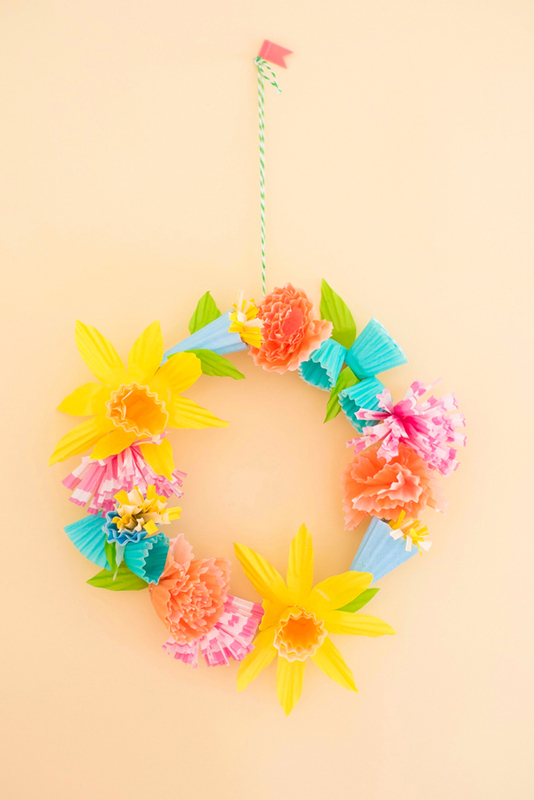 Step 1: Once you have about 14-16 flowers, attach them with hot glue to the embroidery hoop (arrange them roughly before attaching). Step 2: Cut out some green leaf shapes and attach with hot glue between some of the flowers. Step 3: With hot glue, attach two green cake pop sticks to each side of the embroidery hoop. All the flowers are amazing. 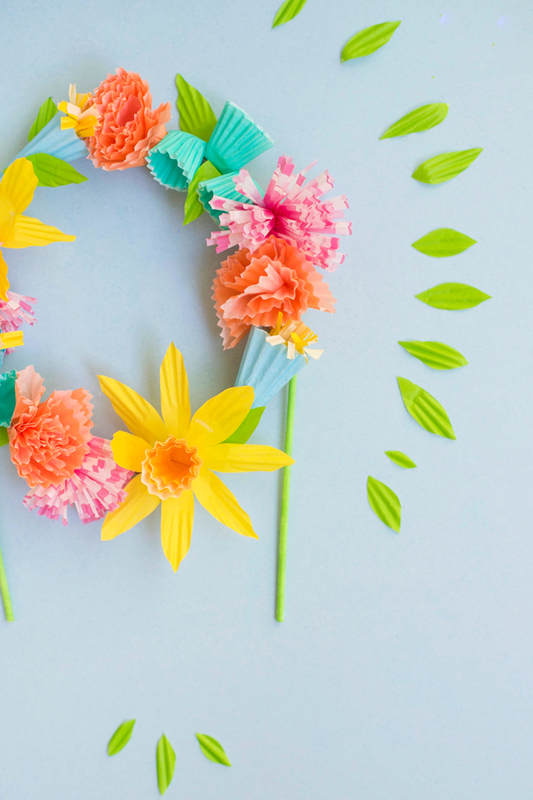 I’m always impressed when someone does a flower DIY. I definitely want to try making this. This is so gorgeous. It would be awesome at ‘Flower Power’ hippie party! Love this idea! 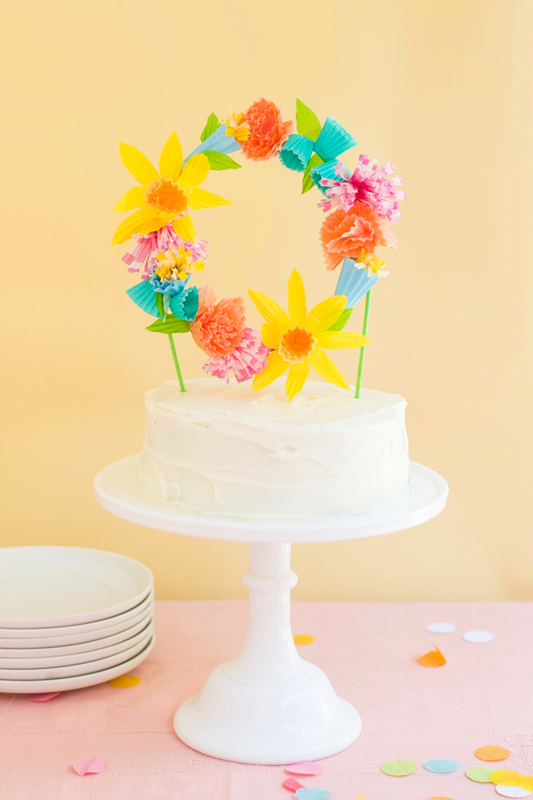 I organized a small garden party for my daughters’ friends and there was a cake with the same wreath. I helped them make it and it coordinated perfectly to the flowers we picked up from the garden to decorate the table.